Evil Academy - is Jackman a HollyROIDS Peloton Cheat? Evil Academy > Discourse > Freethinker's Academy > is Jackman a HollyROIDS Peloton Cheat? 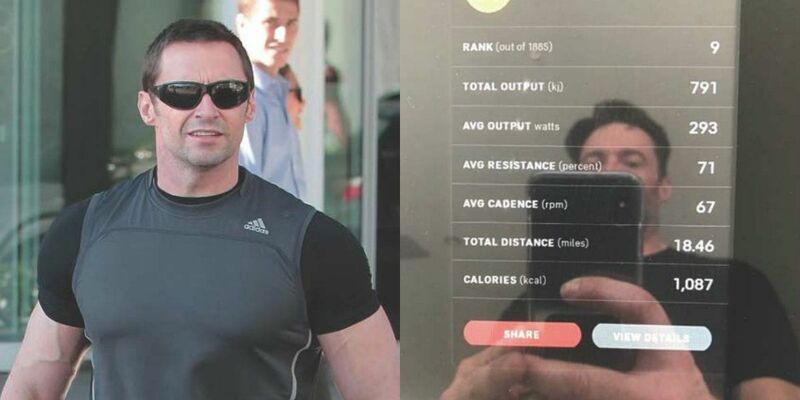 Full Version: is Jackman a HollyROIDS Peloton Cheat? It’s official. Hugh Jackman is not human. We received confirmation of this somewhat unsurprising news this morning via an Instagram post from Jackman himself showing off the results of his most recent Peloton ride. According to the caption, the actor achieved a new personal best in ninth out of 1,885 participants. Pretty sure that's an expensive exercise bike that only 1885 people own, and Hugh Jackman's only job is to stay in shape and be good looking. i never understood how he got to play wolverine. When he's not training weights he is quite a slender person. To be able to bulk up like this on cue would almost suggest that he's on a little something more than he's saying. I have no problem with it though, I would do it if I could be bothered. Seems like a cool guy though. In this video he out Cenna's John Cenna. (07-19-2018 08:54 PM)Redneck Wrote: [ -> ] When he's not training weights he is quite a slender person. HI Professor Redneck! I agree with you and support his freedom of choice to take 'special supplements' but his Peloton and Physical Transformations featured in Fitness News Articles should report the FACTS and if there is aid of fat surgeries and 'special supplements' then it should be stated in the article so that it does not mislead the average fellow when he endeavors to achieve such results as featured in those articles. I was just Saturday at the bookshop where I read a bit of the Chael Sonnen "The Four-Pack Revolution: How You Can Aim Lower, Cheat on Your Diet, and Still Lose Weight and Keep It Off " which was very interesting to read about his fitness experience without aid of 'special supplements' and his musings on the matter. ^ are you implying that Hugh Jackman is GAY? I'm implying that this thread is the type of conversation you might have with gay hairdressers at the salon. (07-20-2018 03:38 AM)jho Wrote: [ -> ] No. this isn't some flim-flam! It is a serious discussion concerning the conspiracy of Fraudulent Fitness Industry Deception! those Fitness Centers can be Sodom and Gomorrah Flesh Temples where the gym-rats worship vanity disguised in yoga pants and tight fitting polo-shirts!